It all started in 1962 with a salesman named Jim Buckwater who wanted to find a solution for his insomniac wife, Trudy. Back then, Trudy realized that she sleep better in motel rooms (she travelled frequently with Jim) compared to she did at home. They soon discovered that the soothing lull of the air conditioner unit in the motels was the main reason that enable Trudy to sleep better. Being a man who loved to tinker, Jim attempted to replicate the whirring noise of the air conditioner. 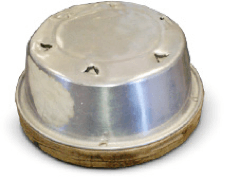 After some hard of work, Jim came up with a simple device: a turntable motor and small fan blade in a dog bowl encased in a disc of foam covered wood. Jim dubbed the his new invention the “sound conditioner”. Words soon got out, and friends of Jim and family were asking for his sleep machine. Seeing the demands, Jim started the company and named it Marpac LLC. And that was how the original Marpac Sleepmate was born and eventually evolved into the current Marpac Dohm after countless iterations. To date, Marpac is the recognised leader in sound conditioners and continues to work on bringing serious sleep to millions of people. Marpac Dohm was evolved from the first sound conditioner “Marpac Sleepmate” over 50 years ago. Its circular shape and uniquely adjustable fan sound was the result of decades of work and conviction to make serious, high quality sound machines. 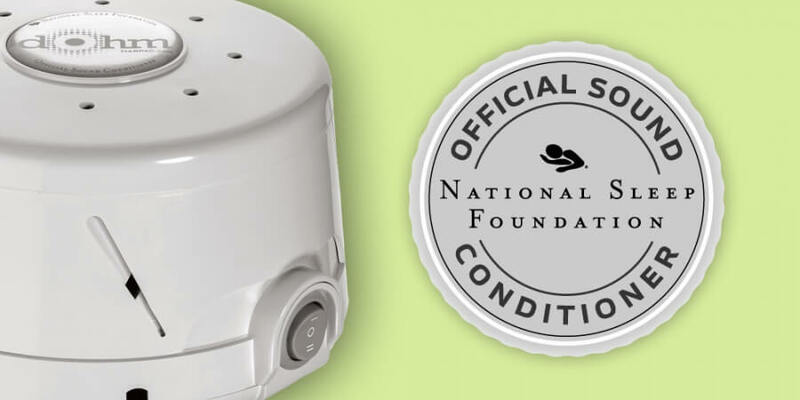 Over the years, Marpac Dohm has received countless rave reviews and was chosen to be the Official Sound Conditioner of the National Sleep Foundation. 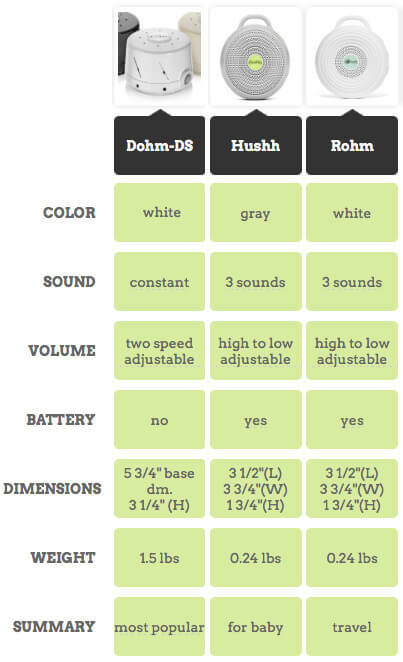 The Dohm consists of an adjustable housing surrounding a two speed electric motor with a unique fan. The adjustable housing allows the device to produce soothing sound of rushing air (i.e. Marpac Signature Sound). This white noise sound has been proven to be capable of effectively block noises over a broad range of frequencies and enable the user to get deep, undisturbed sleep through the night. 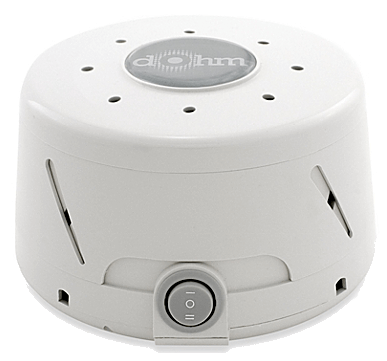 While Marpac Dohm-DS has been an excellent White Noise Sound Machine, it’s weight and size may discourage frequent travelers to bring it along for their trips. 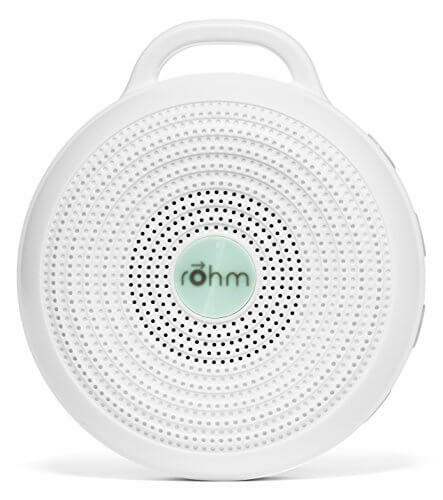 Enter Marpac Rohm Portable White Noise Sound Machine, a portable electronic sound machine suitable for travel or on-the-go use. This compact portable unit is designed to mask noises anywhere, at any time with its consistent and soothing sound. With its great form factor and equipped with rubberized disk, it can be hanged on a door or laid flat on a nightstand without worrying it slide off. Marpac Hushh, a portable electronic sound machine designed to help baby fall asleep and stay asleep anywhere. The Hushh produce a soothing sound that creates a comforting, consistent sound environment for sleep. For a newborn baby who is accustomed to an environment full of whooshing thumps, and gurgles, a complete silence is foreign to them. The calm consistent noise of the Marpac’s sound machines are useful in recreating an environment of the womb which is perfect for babies. Throughout night time or nap time, it masks disruptive noises to promote longer and more restful sleep cycles for your baby and child. 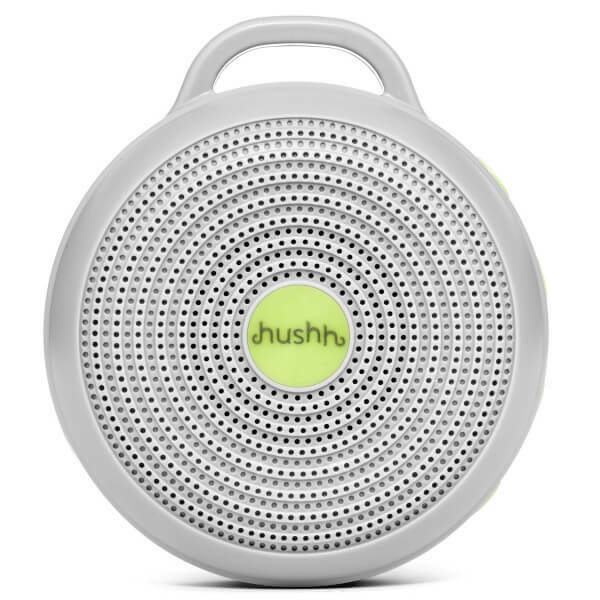 Hushh’s light weight and small form factor make it a highly portable white noise machine to bring along whereever you go. Put it on the stroller, bring it to your child’s daycare centre, or pack it in a diaper bag and you will have comforting white noise for your child, no matter where you are. masks everyday noises, so you don’t have to worry about anyone (or anything) waking baby! What is a sound conditioner? Sound conditioners (also known as sound machines, sleep machines, white noise machines) are machines that emit a consistent, soothing soundtrack. Just as air conditioners moderate the temperature of an environment and drapes allow for the control of light in an environment, sound machines moderate the noise level of an environment. Turn one on, and tune everything else out. A lot of people find that the soothing sound of rushing air is a wonderfully relaxing, all-natural sleep aid. We’ve received a lot of letters and emails from new parents, nightshift workers, spouses of snorers, frequent travelers — even pet owners. All of them thank us, and say that we’ve literally changed their lives. Some people swear by their Marpac sound conditioner for concentration purposes, too, especially in an office or study environment that’s too loud or just too quiet. And for privacy, whether you’re in an apartment or dorm room, in a physician’s or therapist’s office, the sound conditioner is a simple and economical sound-masker. There is no shame in snoring. It happens. But if your snoring keeps your spouse awake, try one of our devices. It’s cheap and noninvasive, nothing to wear on your face or ingest. Thousands of people swear it has saved their marriages. Sleep will not come easily amidst noises from the street, construction sounds, crying kids, music-loving neighbors, or the late-night television watcher next to you. If you don’t live in a serene country cottage, and sometimes, even if you do, you may want to consider getting a sound conditioner. It’s not just a sleep aid, it’s a tool for restoring order to your personal universe. Our white noise helps children sleep like babies (only better!) at nighttime or naptime. Using a sound conditioner helps to establish a sleepy-time ritual that can travel with you to grandma’s house or on vacation. Our machines mask dishwashers, telephone calls, and all of the other not-so-silent things you need to get done without waking the kids, and also provide a consistent sound environment that is especially soothing to infants. We have many “Marpac families” with sound conditioners in every bedroom, and nothing makes us happier than to know that our products are beloved by generations! Get more “A”s from more ZZZZZs… and better studying. Is the person next door is too noisy? Is your room is too quiet? Does your roommate snore like a gorilla. Our machines help students focus by providing a consistent audio backdrop even on loud campuses. Stressed students need sleep. We bring it. You can even skin your Dohm with personalized pictures of your school mascot, your dog, college colors or whatever else strikes your fancy. Its not easy sleeping when you’re out of town. Take along the Zohne, our petite travel sound conditioner, and create a sleepy home away from home. No more hearing people in the hotel hallway or listening to the elevators all night. No tossing and turning in an unfamiliar bed. Many of our customers never leave home without it. A good night’s sleep is worth the space in your suitcase. If you work in an office, especially in a cubicle, you know how distracting office chatter can be. It’s hard to keep your personal telephone conversations private. No more. Our sound conditioners turn cubes into individual sanctuaries with one click. They also keep private offices more “private,” and have the added benefit of enhancing concentration, too! Marpac sound conditioners are ideal for use in settings where you don’t want conversations overheard such as in doctors and therapists offices. This not only makes patients feel more comfortable, but also keeps you aligned with the requirements of HIPAA for patient confidentiality. If you suffer from tinnitus, our sound conditioners may offer some relief. The abilityto manipulate the tone of the sound emitted by the sound conditioner to match the tone in your ringing ears is part of what makes our devices so effective. Many sound conditioners are not up to the tinnitus task. Ours gets a ringing endorsement. It’s not really white, and it’s not really noise. According to Wikipedia, “a random signal is considered ‘white noise’ if it is observed to have a flat spectrum over a medium’s widest possible bandwidth.” What this means to you: White noise can block out sounds across a wide range of frequencies, both more steadily and at a lower volume than, say, your music, which contains a variety of frequencies and is therefore an inconsistent sound-masking experience, no matter how loud you turn it up. That’s the “scientific” explanation. What our years of experience have taught us is that all white noise is not created equal, and the simple, singular sound of rushing air is the most popular white noise. Our customers use the following words (among others) to describe it: “familiar,” “comforting,” “soothing,” “protecting” and, our favorite, “deeply pleasing.” This makes us deeply pleased, too. To find out more about noise and particularly white noise, you may refer to your articles About Noise and How White Noise Machine Is Able To Help You Sleep Better. Dropnoise is a pioneer supplier of products and services for tackling noise nuisance in neighbourhoods. Based in Singapore, we perform noise nuisance recordings for clients and supply a compact and effective range of products to help individuals and families in managing noise nuisance from noisy neighbours. We are the exclusive distributor of Marpac Products in Singapore.